Random duty cycle (RDC) errors in quasi-phase-matching (QPM) gratings lead to a pedestal in the spatial-frequency spectrum that increases the conversion efficiency for nominally phase-mismatched processes. Here, we determine the statistical properties of the Fourier spectrum of the QPM grating in the presence of RDC errors. We illustrate these properties with examples corresponding to periodic gratings with parameters typical for continuous-wave interactions, and chirped gratings with parameters typical for devices involving broad optical bandwidths. We show how several applications are sensitive to RDC errors by calculating the conversion efficiency of relevant nonlinear-optical processes. Last, we propose a method to efficiently incorporate RDC errors into coupled-wave models of nonlinear-optical interactions while still retaining only a small number of QPM grating orders. S. Zhu, Y. Zhu, and N. Ming, “Quasi-phase-matched third-harmonic generation in a quasi-periodic optical superlattice,” Science 278, 843–846 (1997). K. Fradkin-Kashi and A. Arie, “Multiple-wavelength quasi-phase-matched nonlinear interactions,” IEEE J. Quantum Electron. 35, 1649–1656 (1999). K. Fradkin-Kashi, A. Arie, P. Urenski, and G. Rosenman, “Multiple nonlinear optical interactions with arbitrary wave vector differences,” Phys. Rev. Lett. 88, 023903 (2001). M. Baudrier-Raybaut, R. Haidar, P. Kupecek, P. Lemasson, and E. Rosencher, “Random quasi-phase-matching in bulk polycrystalline isotropic nonlinear materials,” Nature 432, 374–376 (2004). M. Asobe, O. Tadanaga, H. Miyazawa, Y. Nishida, and H. Suzuki, “Multiple quasi-phase-matched device using continuous phase modulation of χ(2) grating and its application to variable wavelength conversion,” IEEE J. Quantum Electron. 41, 1540–1547 (2005). G. Porat, Y. Silberberg, A. Arie, and H. Suchowski, “Two photon frequency conversion,” Opt. Express 20, 3613–3619 (2012). J. S. Pelc, Q. Zhang, C. R. Phillips, L. Yu, Y. Yamamoto, and M. M. Fejer, “Cascaded frequency upconversion for high-speed single-photon detection at 1550 nm,” Opt. Lett. 37, 476–478 (2012). M. A. Albota and F. C. Wong, “Efficient single-photon counting at 1.55 μm by means of frequency upconversion,” Opt. Lett. 29, 1449–1451 (2004). J. S. Pelc, C. Langrock, Q. Zhang, and M. M. Fejer, “Influence of domain disorder on parametric noise in quasi-phase-matched quantum frequency converters,” Opt. Lett. 35, 2804–2806(2010). J. S. Pelc, C. R. Phillips, D. Chang, C. Langrock, and M. M. Fejer, “Efficiency pedestal in quasi-phase-matching devices with random duty-cycle errors,” Opt. Lett. 36, 864–866 (2011). J. Kiessling, R. Sowade, I. Breunig, K. Buse, and V. Dierolf, “Cascaded optical parametric oscillations generating tunable terahertz waves in periodically poled lithium niobate crystals,” Opt. Express 17, 87–91 (2009). C. R. Phillips, J. S. Pelc, and M. M. Fejer, “Continuous wave monolithic quasi-phase-matched optical parametric oscillator in periodically poled lithium niobate,” Opt. Lett. 36, 2973–2975 (2011). A. Henderson and R. Stafford, “Spectral broadening and stimulated Raman conversion in a continuous-wave optical parametric oscillator,” Opt. Lett. 32, 1281–1283 (2007). J. E. Schaar, K. L. Vodopyanov, and M. M. Fejer, “Intracavity terahertz-wave generation in a synchronously pumped optical parametric oscillator using quasi-phase-matched GaAs,” Opt. Lett. 32, 1284–1286 (2007). C. R. Phillips and M. M. Fejer, “Stability of the singly resonant optical parametric oscillator,” J. Opt. Soc. Am. B 27, 2687–2699 (2010). D. T. Reid, “Ultra-broadband pulse evolution in optical parametric oscillators,” Opt. Express 19, 17979–17984 (2011). C. R. Phillips and M. M. Fejer, “Adiabatic optical parametric oscillators: steady-state and dynamical behavior,” Opt. Express 20, 2466–2482 (2012). C. Heese, C. R. Phillips, L. Gallmann, M. M. Fejer, and U. Keller, “Ultrabroadband, highly flexible amplifier for ultrashort midinfrared laser pulses based on aperiodically poled Mg:LiNbO3,” Opt. Lett. 35, 2340–2342 (2010). C. Heese, C. R. Phillips, L. Gallmann, M. M. Fejer, and U. Keller, “Role of apodization in optical parametric amplifiers based on aperiodic quasi-phasematching gratings,” Opt. Express 20, 18066–18071 (2012). C. Heese, C. R. Phillips, B. W. Mayer, L. Gallmann, M. M. Fejer, and U. Keller, “75 MW few-cycle mid-infrared pulses from a collinear apodized APPLN-based OPCPA,” Opt. Express 20, 26888–26894 (2012). T. Fuji, J. Rauschenberger, A. Apolonski, V. S. Yakovlev, G. Tempea, T. Udem, C. Gohle, T. W. Haensch, W. Lehnert, M. Scherer, and F. Krausz, “Monolithic carrier-envelope phase-stabilization scheme,” Opt. Lett. 30, 332–334 (2005). C. Langrock, M. M. Fejer, I. Hartl, and M. E. Fermann, “Generation of octave-spanning spectra inside reverse-proton-exchanged periodically poled lithium niobate waveguides,” Opt. Lett. 32, 2478–2480 (2007). C. R. Phillips, C. Langrock, J. S. Pelc, M. M. Fejer, I. Hartl, and M. E. Fermann, “Supercontinuum generation in quasi-phasematched waveguides,” Opt. Express 19, 18754–18773 (2011). C. R. Phillips, C. Langrock, J. S. Pelc, M. M. Fejer, J. Jiang, M. E. Fermann, and I. Hartl, “Supercontinuum generation in quasi-phase-matched LiNbO3 waveguide pumped by a Tm-doped fiber laser system,” Opt. Lett. 36, 3912–3914 (2011). S. Helmfrid and G. Arvidsson, “Influence of randomly varying domain lengths and nonuniform effective index on second-harmonic generation in quasi-phase-matching waveguides,” J. Opt. Soc. Am. B 8, 797–804 (1991). 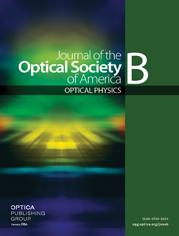 G. Rosenman, K. Garb, A. Skliar, M. Oron, D. Eger, and M. Katz, “Domain broadening in quasi-phase-matched nonlinear optical devices,” Appl. Phys. Lett. 73, 865–867 (1998). G. Imeshev, M. M. Fejer, A. Galvanauskas, and D. Harter, “Pulse shaping by difference-frequency mixing with quasi-phase-matching gratings,” J. Opt. Soc. Am. B 18, 534–539 (2001). R. W. Boyd, Nonlinear Optics, 3rd ed (Academic, 2008). M. Born, E. Wolf, and A. B. Bhatia, Principles of Optics: Electromagnetic Theory of Propagation, Interference and Diffraction of Light (Cambridge University, 1999). M. Charbonneau-Lefort, B. Afeyan, and M. M. Fejer, “Optical parametric amplifiers using chirped quasi-phase-matching gratings I: practical design formulas,” J. Opt. Soc. Am. B 25, 463–480 (2008). D. S. Chemla and J. Zyss, Nonlinear Optical Properties of Organic Molecules and Crystals (Academic, 1987). C. R. Phillips and M. M. Fejer, “Efficiency and phase of optical parametric amplification in chirped quasi-phase-matched gratings,” Opt. Lett. 35, 3093–3095 (2010). R. DeSalvo, A. Said, D. Hagan, E. Van Stryland, and M. Sheik-Bahae, “Infrared to ultraviolet measurements of two-photon absorption and n2 in wide bandgap solids,” IEEE J. Quantum Electron. 32, 1324–1333 (1996). G. Imeshev, A. Galvanauskas, D. Harter, M. A. Arbore, M. Proctor, and M. M. Fejer, “Engineerable femtosecond pulse shaping by second-harmonic generation with Fourier synthetic quasi-phase-matching gratings,” Opt. Lett. 23, 864–866 (1998). R. G. Smith, J. E. Geusic, H. J. Levinstein, J. J. Rubin, S. Singh, and L. G. Van Uitert, “Continuous optical parametric oscillation in Ba2NaNb5O15,” Appl. Phys. Lett. 12, 308–310 (1968). R. L. Byer, M. K. Oshman, J. F. Young, and S. E. Harris, “Visible CW parametric oscillator,” Appl. Phys. Lett. 13, 109 (1968). S. T. Yang, R. C. Eckardt, and R. L. Byer, “Continuous-wave singly resonant optical parametric oscillator pumped by a single-frequency resonantly doubled Nd:YAG laser,” Opt. Lett. 18, 971–973 (1993). L. E. Myers and W. R. Bosenberg, “Periodically poled lithium niobate and quasi-phase-matched optical parametric oscillators,” IEEE J. Quantum Electron. 33, 1663–1672 (1997). A. Henderson and R. Stafford, “Low threshold, singly-resonant CW OPO pumped by an all-fiber pump source,” Opt. Express 14, 767–772 (2006). M. J. McCarthy and D. C. Hanna, “All-solid-state synchronously pumped optical parametric oscillator,” J. Opt. Soc. Am. B 10, 2180–2190 (1993). G. J. Hall, M. Ebrahimzadeh, A. Robertson, G. P. A. Malcolm, and A. I. Ferguson, “Synchronously pumped optical parametric oscillators using all-solid-state pump lasers,” J. Opt. Soc. Am. B 10, 2168–2179 (1993). S. T. Yang, R. C. Eckardt, and R. L. Byer, “Power and spectral characteristics of continuous-wave parametric oscillators: the doubly to singly resonant transition,” J. Opt. Soc. Am. B 10, 1684–1695 (1993). R. Eckardt and J. Reintjes, “Phase matching limitations of high efficiency second harmonic generation,” IEEE J. Quantum Electron. 20, 1178–1187 (1984). M. Conforti, F. Baronio, C. De Angelis, M. Marangoni, and G. Cerullo, “Theory and experiments on multistep parametric processes in nonlinear optics,” J. Opt. Soc. Am. B 28, 892–895 (2011). Fig. 1. Schematic of a QPM grating with RDC errors. Vertical dashed lines indicate the ideal, equally spaced domain boundary positions. Elements of the domain boundary vectors z (random) and z 0 (ideal) are indicated. Fig. 2. Fourier spectra | g ˜ ( k ) | 2 with parameters σ z = 1 μm and a 5 cm crystal, and K g 0 = 2 × 10 5 m − 1 ( ≈ 31.4 μm period). The inset shows | g ˜ ( k ) | 2 on a linear scale in the vicinity of first-order QPM; the effects of RDC errors cannot be seen on this linear scale. Fig. 3. Fourier spectra for a large, 3 μm, mean error in the domain boundaries. The grating is 1 cm long and the grating k -vector is K g = 2 × 10 5 m − 1 (QPM period ≈ 31.4 μm ). For the red curve, the spectrum | g ˜ ( k ) | 2 was averaged over 50 gratings. The black curve corresponds to the analytical ensemble average from Eq. (9). The dashed blue curve shows a suitably normalized 1 / k 2 profile, which is the asymptotic functional form of the noise pedestal in Eq. (9) for large k .
Fig. 4. Fourier spectra for an example linearly chirped QPM grating with σ z = 1 μm , a chirp rate of d K g / d z = 2.5 × 10 6 m − 2 , grating length 1 cm, and mean grating k -vector K g 0 = 2 × 10 5 m − 1 . Fig. 5. Fourier spectrum arising from domain boundary variations defined by a grating phase perturbation δ ϕ ( z ) defined by applying a sinc filter to white noise. (5) g ˜ z ( k ) ≈ i π k L ∑ n = 1 N ( − 1 ) n e − i k z [ n ] . (10) | g ˜ z 0 ( k ) | 2 = [ π 2 sinc ( k Λ D 2 ) ] 2 [ sin ( N Δ k 1 Λ D / 2 ) N sin ( Δ k 1 Λ D / 2 ) ] 2 . (11) d ( z ) d 0 ≡ sgn [ cos ( ϕ ( z ) ) − cos ( π D ( z ) ) ] ≡ ( 2 D ( z ) − 1 ) + ∑ m = − ∞ ∞ m ≠ 0 2 sin ( π m D ( z ) ) π m exp ( i m ϕ ( z ) ) . (13) g ˜ z ( d c ) ( k ) = π 2 ( 2 D − 1 ) e − i k L / 2 sinc ( k L 2 ) . (16) Δ k ( ω , ω ′ ) = k ( ω + ω ′ ) − k ( ω ) − k ( ω ′ ) . (18) A ˜ i ( ω ) = − i 2 L π ω d 0 n ( ω ) c g ˜ z ( Δ k ( ω ) ) × F [ A p ( z = 0 , t ) A s ( z = 0 , t ) * ] ( ω ) . (19) 〈 W i 〉 ≈ 2 ϵ 0 ω i 2 d 0 2 L Λ D n i c 1 − e − Δ k ( ω i ) 2 σ z 2 Δ k ( ω i ) 2 Λ D 2 × ∫ | A p ( z = 0 , t ) A s ( z = 0 , t ) * | 2 d t .
(20) 〈 | g ˜ z ( k ) | 4 〉 ≈ 2 N 2 ( π k L ) 4 ( 1 − e − ( k σ z ) 2 ) 2 + 4 N ( π k L ) 2 ( 1 − e − ( k σ z ) 2 ) e − ( k σ z ) 2 | g ˜ z 0 ( k ) | 2 + e − 2 ( k σ z ) 2 | g ˜ z 0 ( k ) | 4 . (21) σ η ≈ N ( π k L ) 2 ( 1 − e − k 2 σ z 2 ) . (24) 〈 | g ˜ ( k ) | 2 〉 ≈ 1 N ( 1 − e − k 2 σ z 2 ) + e − k 2 σ z 2 sinc ( ( k − K g ) L / 2 ) 2 . (28) I max = n SH ϵ 0 c 2 | 2 π ω 1 d eff n SH c A FH 2 L | 2 . (29) 〈 | h ˜ z ( m ) ( k ) | 4 〉 ≈ 2 m 2 ( π k L ) 4 ( 1 − e − ( k σ z ) 2 ) 2 + 4 m ( π k L ) 2 ( 1 − e − ( k σ z ) 2 ) e − ( k σ z ) 2 | h ˜ z 0 ( m ) ( k ) | 2 + e − 2 ( k σ z ) 2 | h ˜ z 0 ( m ) ( k ) | 4 . (32) ∭ I ¯ 1 4 ( x , y , t ) d x d y d t = ( π 8 ) 3 / 2 w 2 τ 2 ln ( 2 ) . (34) Γ s 2 = ω i ω p ( 2 d 0 / π ) 2 | A s | 2 L 2 n i n p c 2 . (36) 〈 W SH 〉 = 2 ϵ 0 ω s 2 d 0 2 L Λ D n SH c 1 − e − Δ k s 2 σ z 2 Δ k s 2 Λ D 2 ∫ | A s ( z = 0 , t ) 2 | 2 d t .
(40) A SH = − 2 ω SF ω s d 0 2 L 2 π 2 n SH n SF c 2 A p ( 0 ) A s ( 0 ) 2 a SF . (A1) δ ϕ ( z ) ≡ ϕ ( z ) − ϕ 0 ( z ) .